Radio taps the keys as seven-ship flying typewriter prints 15-mile-long placards at 10,000 feet. WRITERS in the sky have abandoned old-fashioned, one-plane “penmanship.” Now they’re “typing” out their aerial messages in neat block letters. The “keys” of Skytyping are seven planes that fly a straight, parallel course across the sky. Electronic controls puff smoke at preselected intervals to form celestial letters as in the word “T E S T,” shown in the photo at the top of this page. A “mother” plane, flying in the center of the formation, automatically controls the entire operation. It transmits a constant stream of radio tone signals at one-second intervals. As receiving sets in each of the seven planes, including the mother plane, pick up the signals, switches are thrown in a control board that has 200 plug-in sockets. The board in each plane has been preset according to a message pattern. When a puff of smoke is desired to form part of a letter, a plug-in closes an electronic circuit. That, in turn, opens a special valve in the, engine, releasing a small quantity of oil-base chemical into the exhaust pipe.
. Heat of the engine expands the chemical into smoke at a rate of 1,000,000 cubic feet a minute. The result is a huge, 375,000-cubic-foot smoke puff left in the sky. Where no puff is desired, there is no plug-in on the control board, and the switch activated by the mother plane’s radio tone clicks a blank. 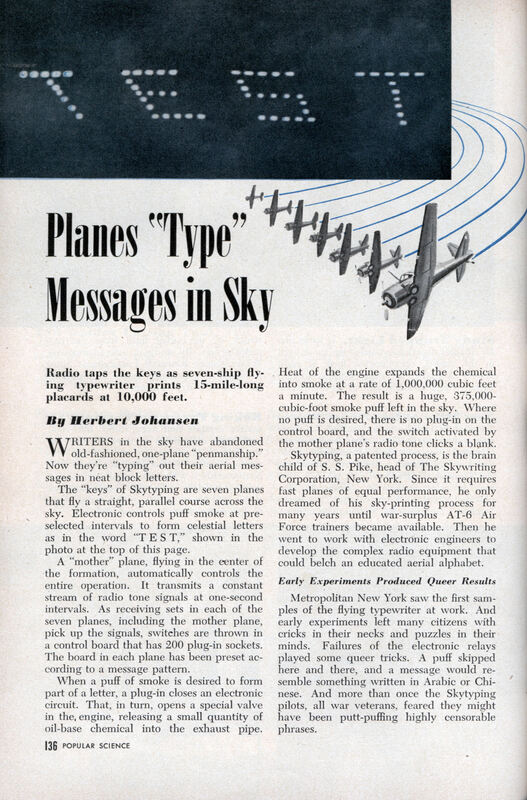 â€ž Skytyping, a patented process, is the brain child of S. S. Pike, head of The Skywriting Corporation, New York. 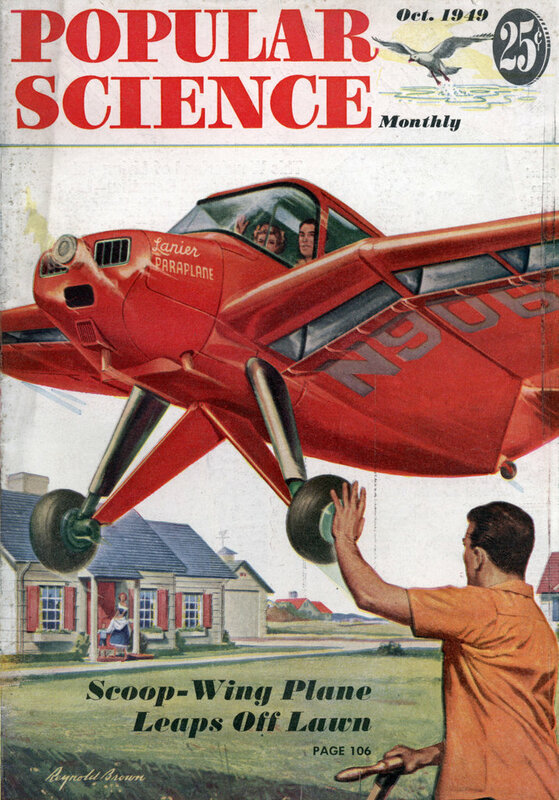 Since it requires fast planes of equal performance, he only dreamed of his sky-printing process for many years until war-surplus AT-6 Air Force trainers became available. Then he went to work with electronic engineers to develop the complex radio equipment that could belch an educated aerial alphabet. Metropolitan New York saw the first samples of the flying typewriter at work. And early experiments left many citizens with cricks in their necks and puzzles in their minds. Failures of the electronic relays played some queer tricks. A puff skipped here and there, and a message would resemble something written in Arabic or Chinese. And more than once the Skytyping pilots, all war veterans, feared they might have been putt-puffing highly censorable phrases. But that’s all straightened out now, according to Mr. Pike. His spelling planes do a smooth job. Flying at about 180 m.p.h., a team of seven AT-6s can print a 21-letter, 15-mile-long message across the sky in five minutes. Each letter, approximately a mile long and half a mile wide, is made in 10 seconds flat. The messages, or slogans, are written at altitudes of from 10,000 to 15,000 feet, depending on air turbulence. Pike says that on clear days his Skytyping can be read 40 miles away, with the letters remaining intact as long as half an hour. In the old, one-plane skywriting, the first letter of a word is often gone with the wind before the last letter is formed. It also involves complicated flying maneuvers, with hazardous loops, rolls, and dives needed to form the characters. In Skytyping, on the other hand, the pilots simply fly a straight line. Everything else is automatic from the word “Start,” called out by the pilot of the middle mother plane over his voice radio. When the full message has been spelled out, as preset in the switchboards, a light signals “End,” and the control pilot orders everyone to flip a “Reset” switch that zeroes the electronic relays, readying the planes’ smoke-puffing apparatus for another spelling run across the sky.